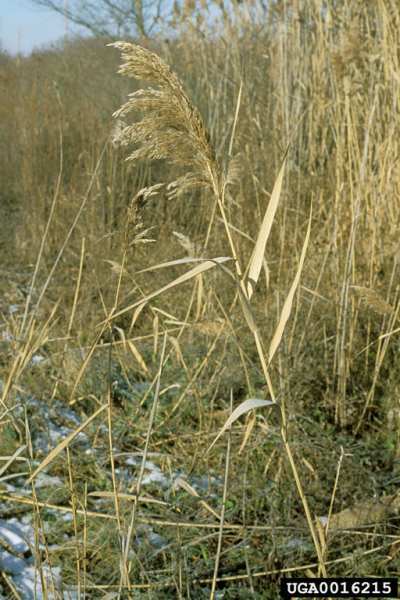 Arundo phragmites , L. var. humilis (DeNot.) Asch. & Graebn. 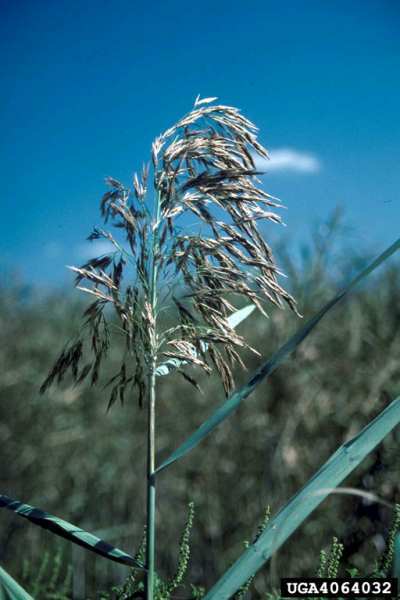 Arundo phragmites , L. var. isiaca Griseb. Phragmites communis , Trin. forma flavescens (Custor ex Gaudin) Alef. Phragmites communis , Trin. forma isiacus (Griseb.) Alef. Phragmites communis , Trin. forma nigricans (Merat) Alef. Phragmites communis , Trin. var. isiacus (Griseb.) Coss. Phragmites communis , Trin. var. vulgaris Boenn. Phragmites communis , Trin. var. humilis (DeNot.) Parl. Phragmites karka , (Retz.) Trin. ex Steud. Phragmites maximus , (Forssk.) Chiov. Phragmites phragmites , (L.) H.Karst. Phragmites vulgaris , Crep. subsp. maximus (Forssk.) Chiov. Xenochloa arundinacea , Lichtenstein ex Roem. & Schult. Phragmites australis grows on level ground in tidal and non-tidal marshes, lakes, swales and backwater areas of rivers and streams. It is found on sites that are seasonally flooded with not more than 50cm of water. It grows on most soil textures from fine clay to sandy loams and is somewhat tolerant of saline or alkaline conditions. Phragmites australis is especially common along railroad tracks, roadside ditches and piles of dredge spoil, wherever slight depressions will hold water. Throughout most of its range, it typically forms closed mono-dominant stands in both disturbed and pristine areas. It is capable of vigorous vegetative reproduction and its seeds, which are normally dispersed by wind, may be transported by birds that nest among the reeds. The seeds are also dispersed by water. Newly opened sites may be colonised by seed or by rhizome fragments carried to the area in soils and on machinery or naturally in floodwaters. Invasion and continued spread is aided by disturbances or stresses such as pollution, alteration of the natural hydrologic regime, dredging and increased sedimentation. In coastal marshes, spread of Phragmites australis is also facilitated by natural disturbance caused by tidal movements of dead vegetation. Uchytil (1992) states that P. australis is a tall, warm-season, perennial, sod-forming grass. The culms are erect, rigid, smooth, and hollow. They may be nearly 2.5cm in diameter and from 2 to 4m tall, terminating in a dense, 30-cm panicle. Leaves arise from the culm and are mostly 25-50cm long and 1-5cm wide. It has an extensive rhizome network and occasionally produces stolons as well. Rhizome depth has been variously reported: (1) 40-100cm (Haslam 1972, in Uchytil, 1992); (2) mostly between 10-30cm, but up to 100cm (Fiala 1976, in Uchytil, 1992); and (3) mostly between 20-100cm, but up to 200cm (Cross and Fleming 1989, in Uchytil, 1992). Roots grow down to a depth of about 1 m. OPBWG (Undated) states that the feathery, plume-like flower head is 13-40cm long and composed of many long branches that point upwards. Narrow clusters of flowers are arranged densely along the branches. The flowers are surrounded by silky white hairs that are purplish at first, becoming tawny to dark brown at maturity. Seeds are brown, thin and delicate. A long, narrow bristle is attached to each seed. The seed and bristle together measure approximately 8mm long. There is now evidence that although the species itself is indigenous to North America, new, more invasive genotype(s) have been introduced from the Old World (Saltonstall 2002, 2003a). Native genotypes persist across the continent, however the Atlantic coast has been largely taken over by the introduced variety with relict native populations found in only a few sites. Native genotypes are found throughout the Midwest, particularly in natural areas, but introduced populations are also common along roadsides and along the shores of the Great Lakes. West of the Rockies, native populations persist at many sites but introduced ones are found in urban areas . Another variety is found in southern North America from Florida across to the Gulf of California which cannot be described as native or non-native to the Continent due to its presence in Asia and South America. Introduced P. australis can also be found in the Mississippi River Delta (Saltonstall 2003b). Marks et al. (1993) report that P. australis' rhizomes live for 3 to 6 years and buds develop at the base of the vertical type late in the summer each year. These buds mature and typically grow about 1 metre (up to 10m in newly colonised, nutrient-rich areas) horizontally before terminating in an upward apex and going dormant until spring. The apex then grows upward into a vertical rhizome, which in turn produces buds that will form more vertical rhizomes. Vertical rhizomes also produce horizontal rhizome buds, completing the vegetative cycle. The aerial shoots arise from the rhizomes. They are most vigorous at the periphery of a stand where they arise from horizontal rhizomes, as opposed to old verticals (Haslam 1972, in Marks et al. 1993). Temperature, salinity and water levels affect seed germination. Water depths of more than 5cm and salinities above 20 ppt (2%) prevent germination (Kim et al. 1985, Tucker 1990, in Marks et al. 1993). Marks et al. (1993) state that the germination is not affected by salinities below 10 ppt (1%) but declines at higher salinities. Percentage germination increases with increasing temperature from 16 to 25 deg-C while the time required to germinate decreases from 25 to 10 days over the same temperature range. Uchytil (1992) states that P. australis has been cultivated and used for many purposes around the world. In Europe, it is used as thatching, to make mats, and as fodder and bedding for cattle. The aerial stems are sometimes used as a cellulose source in the paper and textile industries. Native people of the American Southwest used the stems to make arrow shafts, prayer sticks, weaving rods, pipestems, mats, screens, nets, and thatching. They also used the rootstocks and seeds as food. In the Southwest, it is also used for lattices and in the construction of adobe huts. It is used in many wetland rehabilitation and stabilization projects. It is used to revegetate disturbed riparian areas, control shore erosion, stabilize river and canal banks, and reduce wave action on watershed structures. P. australis is especially common in alkaline and brackish (slightly saline) environments (Haslam 1972, 1971b, in Marks et al., 1993) and can also thrive in highly acidic wetlands (Rawinski, pers. comm. 1985, in Marks et al. 1993). However, it does not require, nor even prefer these habitats to freshwater areas. It is often found in association with other wetland plants including species from the following genera: Spartina, Carex, Nymphaea, Typha, Glyceria, Juncus, Myrica, Triglochin, Calamagrostis, Galium, and Phalaris (Howard et al. 1978, in Marks et al. 1993). Salinity and depth to the water table are among the factors that control its distribution and performance. Maximum salinity tolerances vary from population to population; reported maxima range from 12 ppt (1.2%) in Britain to 29 ppt in New York state to 40 ppt on the Red Sea coast (Hocking et al. 1983, in Marks et al. 1993). It grows on most soil textures from fine clays to sandy loams and is somewhat tolerant of saline or alkaline conditions (Uchytil, 1992). It occurs in disturbed areas as well as pristine sites. It is especially common along railroad tracks, roadside ditches, piles of dredge spoil, and wherever even slight depressions hold water (Ricciuti 1983, in Marks et al. 1993). Uchytil (1992) states that it grows on level ground in freshwater marshes, oxbow lakes, swales, and backwater areas of river and streams. Various types of human manipulation and/or disturbance are thought to promote P. australis (Roman et al. 1984, in Marks et al. 1993). For example, restriction of the tidal inundation of a marsh and sedimentation may favour P. australis (Klockner, pers. comm. 1985, in Marks et al. 1993). In some areas, P. australis may have been promoted by the increases in soil salinity that result when de-icing salt washes off roads and into nearby ditches and wetlands (McNabb and Batterson 1991, in Marks et al. 1993). Marks et al. (1993) state that P. australis is capable of vigorous vegetative reproduction and often forms dense, virtually monospecific stands. Newly opened sites may be colonized by seed or by rhizome fragments carried to the area by humans in soils and on machinery during construction or naturally in floodwaters. Once a new stand of P. australis takes hold, it spreads predominantly through vegetative reproduction. 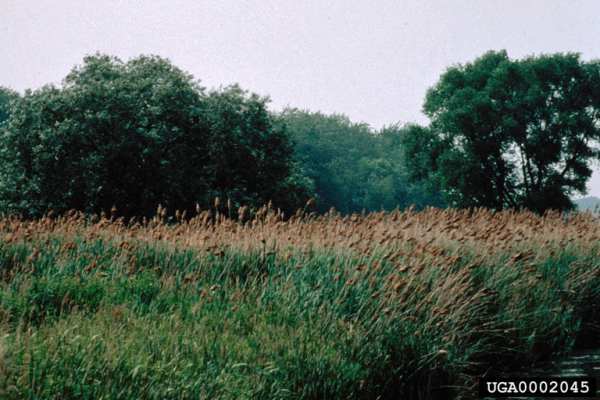 Uchytil (1992) states that annual rhizome lateral spread averaged 40cm in common reed stands in Wisconsin. In Europe, lateral rhizome spread has been as great as 1-2m per year. Stolons, which may grow up to 10.8cm per day, are produced in young stands or over open water and further aid in rapid stand expansion. The plants may produce great quantities of seed. However, in some cases, most or all of the seed produced is not viable (Tucker 1990, in Marks et al. 1993). Marks et al. 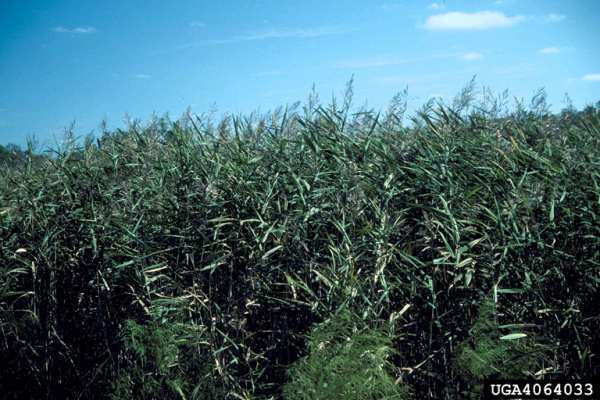 (1993) suggest that increases in nutrient concentrations, especially nitrates, are primarily responsible for increases in Phragmites populations. Ironically, eutrophication and increases in nitrate levels are sometimes blamed for the decline of P. australis populations in Europe (Den Hartog et al. 1989, in Marks et al. 1993). Uchytil (1992) states that P. australis has been used in many wetland rehabilitation and stabilization projects. It is used to revegetate disturbed riparian areas, control shore erosion, stabilize river and canal banks, and reduce wave action on watershed structures. Recommended citation: Global Invasive Species Database (2019) Species profile: Phragmites australis. Downloaded from http://www.iucngisd.org/gisd/species.php?sc=301 on 21-04-2019. Marks et al. (1993) state that many populations of Phragmites are \"benign\" and pose little or no threat to other species and should be left intact. Stable populations may be difficult to distinguish from invasive populations. 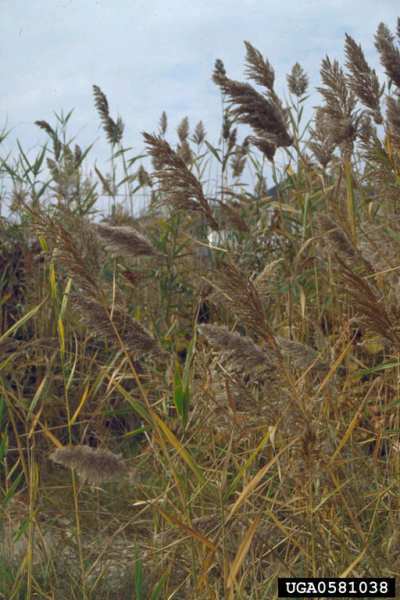 Phragmites is a problem when and where stands appear to be spreading while other species typical of the community are diminishing. Many Atlantic coast wetland systems have been invaded by it as a result of tidal restrictions imposed by roads, water impoundments, dikes and tide gates. The invasions may threaten wildlife because Phragmites alters the structure and function (wildlife support) of relatively diverse Spartina marshes (Roman et al. 1984, in Marks et al. 1993). In the United States this is a problem on many of the eastern coastal National Fish and Wildlife Refuges. The invasions also increase the potential for marsh fires during the winter when the above ground portions of the plant die and dry out (Reimer 1973, in Marks et al. 1993). Dense congregations of redwing blackbirds (Agelaius phoeniceus), which nest in P. australis stands preferentially, increase chances of airplane accidents nearby. The monitoring and control of mosquito breeding is nearly impossible in dense stands (Hellings and Gallagher 1992, in Marks et al. 1993). In addition, the invasions can also have adverse aesthetic impacts. Marks et al. (1993) cite that the invasive populations of P. australis must be managed in order to protect rare plants that it might outcompete, valued animals whose habitat it might dominate and degrade, and healthy ecosystems that it might greatly alter. Cultural, mechanical and/or chemical methods can be used for control. For details on chemical, physical, biological control options, please see management information. Informations on Phragmites australis has been recorded for the following locations. Click on the name for additional informations. Bertness, M. D., P. J. Ewanchuk, and B. R. Silliman. 2002. Anthropogenic modification of New England salt marsh landscapes. Proceedings of the National Academy of Sciences USA 99:1395-1398. Marks M., Lapin B. & Randall J. 1993 Element Stewardship Abstract for Phragmites australis. The Nature Conservancy. Summary: An Element Stewardship Abstract containing detail report on description, distribution, dispersal methods, impacts, habitats and control. Uchytil R.J., 1992 SPECIES: Phragmites australis U.S. Department of Agriculture, Forest Service, Rocky Mountain Research Station, Fire Sciences Laboratory. Summary: Detailed report on description, distribution, impacts, habitats and control. Available from: http://www.fs.fed.us/database/feis/plants/graminoid/phraus/all.html [Accessed 12 June 2003]. Virginia Department of Conservation and Recreation and Virginia Native Plant Society (VDCR/VNPS), UNDATED. 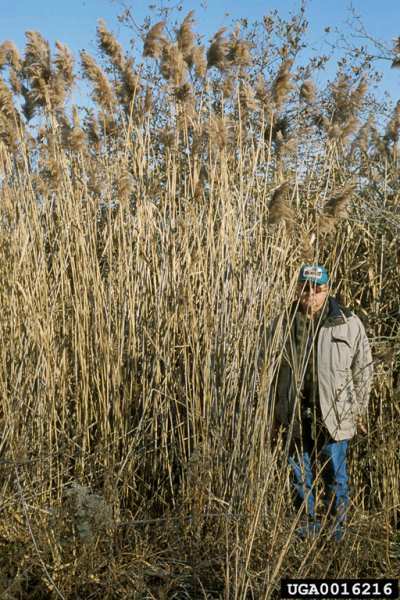 Invasive Alien Plant Species of Virginia: Common Reed (Phragmites australis). Richmond, Virginia. Summary: Detailed report on description, habitat, background, distribution, ecological threat and management. Langeland, K.A. and Burks, K. C (Eds) 1998. Identification and Biology of Non-Native Plants in Florida s Natural Areas, University of Florida. Neyraudia reynaudiana. Minchinton, T.E. 2002. 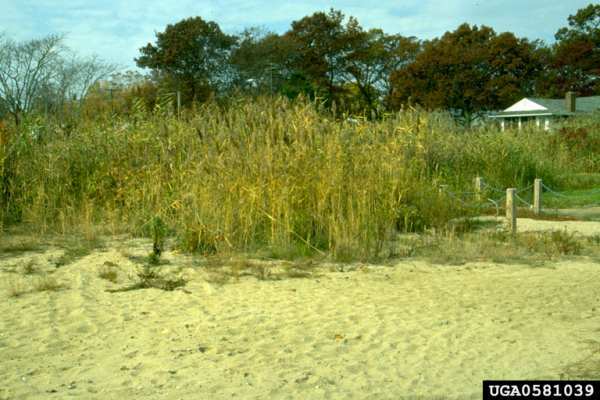 Disturbance by wrack facilitates spread of Phragmites australis is a coastal marsh. Journal of Experimental Marine Biology and Ecology 281:89-107. Summary: Study on how natural tidal movements of dead vegetation causes its spread. Ostendorp, W. 1989. 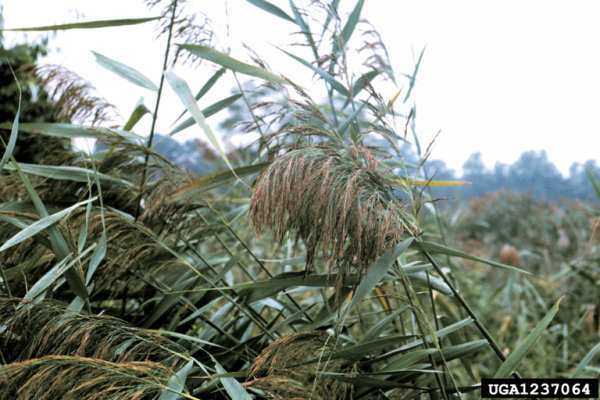 Dieback of reeds in Europe - A critical review of literature. Aquatic Botany 35: 5-26. Summary: Lit review of reed decline in Europe. Saltonstall, K. 2002. Cryptic invasion of a non-native genotype of the common reed, Phragmites australis, into North America. Proceedings of the National Academy of Sciences USA 99(4): 2445-2449. Summary: Study describing the existence of native, non-native, and Gulf Coast varieties of Phragmites in North America. Saltonstall, K. 2003. Genetic variation among North American populations of Phragmites australis: implications for management. Estuaries 26(2B):445-452. Summary: Study describing the distribution of native, non-native, and Gulf Coast varieties of Phragmites in North America. Saltonstall, K. 2003. Microsatellite variation within and among North American lineages of Phragmites australis. Molecular Ecology 12(7): 1689-1702. Summary: Short list of common names and synonyms. Available from: http://www.plantatlas.usf.edu/main.asp?plantID=1310 [Accessed 12 June 2003].